The author and copyright holder of this material is Tyre-Rite Ltd. Copying and reproduction is strictly forbidden. For the purposes of these Terms and Conditions the following definitions apply: Company : Tyre-Rite Ltd.. Goods : The range of products and services which are available for purchase from Tyre-Rite Ltd. Us, We, Our, Ourselves : The Company. You, Your, Yourself : The Customer, the person or organisation who is buying goods. Contract : The contract for sale of goods by us and purchase of goods by you. Marks : Trademarks, service marks, trade names and logos. This website is wholly owned and operated by Tyre-Rite Ltd. Please see our Customer Services page for full contact details. You agree that any order you place with us is an offer to purchase the goods listed in your order and will be governed by these Terms and Conditions. All orders must then be accepted by Tyre-Rite Ltd. We may choose not to accept your order for any reason. After having received your order, we will send you an e-mail ("Order Receipt") confirming receipt of your order and containing the details of your order. Please note that the Order Receipt e-mail is not an acceptance of your order. Acceptance of your order and the formation of the contract of sale between yourself and Tyre-Rite Ltd. will only take place when the goods have been sent out to you and you have received an e-mail confirmation of this from us (“Dispatch Confirmation”). Any goods on the same order which we have not confirmed to have been dispatched in a Dispatch Confirmation e-mail do not form part of that contract. All material included on this website, such as text, graphics, logos, button icons, images, audio clips, video clips, digital downloads, data compilations, software, design applications and other elements available on or through this website are protected by United Kingdom and International copyright, trade mark and other laws. Your use of the website does not transfer to you any ownership or other rights in the website or its content. You may only use the website in the manner described specifically in these Terms and Conditions. You are permitted to print or download extracts from this material for your personal use only to assist you in making a purchase from us. 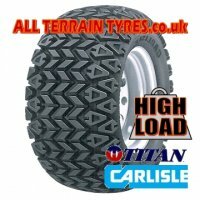 No material may be copied, imitated, reproduced, republished, uploaded, posted, transmitted, modified, indexed, catalogued, or distributed in any way, in whole or in part for commercial use or gain without written consent from a Director of Tyre-Rite Ltd..
'allterraintyres.co.uk', 'allterraintyres.com' and 'tyre-rite' names and logos are either registered or unregistered trade marks/service marks, trade names and/or logos (collectively known as Marks) owned by Tyre-Rite Ltd.. Other product and company names and logos appearing on this website may be registered or unregistered trade names, trade marks/service marks of their respective owners who may or may not be affiliated with, connected to, or sponsored by Tyre-Rite Ltd.. Any use of the Marks displayed on this website is strictly prohibited without written consent from a Director of Tyre-Rite Ltd.. Nothing appearing on this website or elsewhere shall be construed as granting, by implication, estoppel, or otherwise, any licence or right to use any Marks displayed on this website. The Company's Marks may not be used in connection with any product or service or in any manner that is likely to cause confusion among customers, or in any manner that disparages or discredits Tyre-Rite Ltd.
Every effort is taken to ensure that the information contained in this site is correct and up to date. The information may, however, become incomplete, inaccurate or out of date. To the full extent permitted by law we disclaim all warranties and representations (whether implied or expressed) as to the accuracy of any information contained on this website. This website is made available to you for your proper use only. You may access and browse the website using commercially available, SSL-capable Internet browser software. You may print or download material for your personal use only to assist you in making a purchase from us. You must not delete, modify or remove any visible or non-visible identification, marks, notices, or disclaimers from any downloaded material. No material may be copied, imitated, reproduced, republished, uploaded, posted, transmitted, modified, indexed, catalogued, or distributed in any way, in whole or in part for commercial use or gain without written consent from a Director of the Company. Tyre-Rite Ltd. may suspend, alter, restrict or terminate at any time access to or use of this website. All machinery, and particularly motorised machinery can be dangerous. It must be your responsibility to assess the suitability and fitness for purpose of any goods you buy from us. If you are unable to carry out this assessment, you should consult someone who can do this for you before putting into use any goods purchased from us. All information and advice on this website is offered in good faith, but we shall not be liable for any damage or loss that may occur from the use of, or acting upon any information or advice given by us. Tyre-Rite Ltd is not responsible for this website's accuracy or it's fitness for a particular purpose or the reliability of the access to this website. We are not liable for any damages or losses resulting from your use of or inability to use this webite. We do not guarantee that this webite will operate free of error or that it is free from computer viruses or any other contaminating computer program. We will not be liable to you or in breach of the Contract for delay or failure to perform due to any causes beyond the reasonable control of ourselves or our suppliers, including, but not limited to, acts of God, civil commotion, industrial dispute, riots, flood, and legislation. You will be required to register personal information with us if you wish to place on order on the online shop. You agree that the information you provide is true, accurate, current and complete in all respects. We only ask you for sufficient personal information to enable us to proces payment for, and effect delivery of the goods which you order. None of this information is shared with or disclosed to any third party. This website may contain links to other websites and we recommend that you check the privacy and security policies and procedures of all such other websites you visit. You understand that any message or information you send to this website may be read or intercepted by others unless there is a special notice that a particular message is encrypted. All prices quoted are in British Pounds (£) and include Value Added Tax (VAT). If you are an overseas customer, you will be charged in British Pounds. Any comission, currency exchange or other costs you incur in making this payment will be your responsibility. We aim to display only goods that are available and which can be dispatched to you promptly. From time to time we may sell out of some lines, in which case we will aim to advise you by the next working day after you have placed your order. If this does occur, you will be given the opportunity to order an alternative, wait for the goods to become available or receive a full refund of any monies paid. Occasionally there may only be limited quantities of goods available at a certain price. Should you place an order after these goods have been sold, you will be offered a full refund of any monies paid if you do not wish to accept the new price. Tyre-Rite Ltd. makes no representation as to the goods, items, products or services referred to in, or sold from this website as being available or suitable for any paricular use. If you change your mind about anything you order, you can cancel or amend that order at any time prior to despatch without charge. You do not have to provide any reason for cancellation. If goods have been despatched, we will cancel the order and refund monies paid less any packing, delivery and return costs we have incurred. If your order or invoice does not display a separate packing and delivery charge, these costs will still have been incurred and will be deducted from any refund due. There is a minimum order cancellation and restocking charge of £10.00 including vat. In the event of order cancellation we will refund all money due within 10 working days from receipt of the goods back into our warehouse. We offer all customers a thirty day, no quibble refund on all goods EXCEPT those which at your request or of necessity are the subject of special manufacture, assembly, modification or alteration prior to despatch - these goods are not returnable or refundable. This exception includes all of our tyre and wheel assemblies - They are built to order and are not returnable as the components would become fitted and used if they were returned and disassembled. All goods are to be returned at your own expense and must be complete, unused and unfitted (absolutely no test fitting or inflating is permitted in the case of wheels, tyres and inner tubes) and have all original contents, instructions, documentation and packaging. If returned goods do not comply with this requirement, a refund will be refused. Packing and delivery costs of the goods to you, and collection costs of the goods from you when necessary, will be deducted from the amount refunded. If the reason for return is due to a warranty claim, we will refund any reasonable return costs you may incur once the claim has been approved. If the claim is rejected, no refund will be made, and the goods will be made available for you to collect from us for a period of 30 days, after which they will be disposed of. BEFORE RETURNING ANY GOODS, it is essential to contact us by telephone, letter or e-mail for the correct returns address and a Goods Returned Number. Please note, no returned goods will be accepted into our warehouse without a Goods Returned Number on the outer packaging. DO NOT return goods to the company registered address as displayed on our invoices, they will not be accepted. This is a correspondence address only. We aim to deliver goods of the highest quality. We warrant all goods sold by Tyre-Rite Ltd. will meet their specification and are suitable for the purpose for which they were designed. All goods are covered by a manufacturer's guarantee, the duration, terms and conditions of which will vary depending on the product and it's manufacturer. Specific warranty details can be supplied on request for goods available from Tyre-Rite Ltd. prior to purchase. Most items are covered by a twelve months return to base guarantee, limited to repair or replacement of the item only. In the case of tyre claims, an adjustment or charge will be made according to the percentage of usable tread remaining on the faulty tyre. No claim can be considered for any consequential loss. Any goods which have been altered, modified, abused or used for any purpose other than that which it was designed for, or not maintained as required in the instructions will not be covered by warranty. It will be the decision of either Tyre-Rite Ltd. or the product's manufacturer or agent to inspect and determine the validity of any claim, then repair or replace and return to you any faulty items as they see fit. If a claim is rejected, no refund will be made, and the goods will be made available for you to collect from us for a period of 30 days after which they will be disposed of. If you wish to contest the rejection of a claim, you must supply us with a written examination report detailing the reasons from a professional person or organisation holding the necessary skill or qualifications to determine those reasons. Only then will we re-assess your claim. If you have not received your order within the timescale specified on the order confirmation please get in touch as soon as possible. Please inspect your order on receipt. Any claims for shortages, incorrect or damaged items must be made within 7 days of receipt of your order. Any claims for non-delivery must be received by us within 14 days of the original order date. Our primary method of contact with customers is by e-mail. E-mails to you will be sent to the address you specify to us. It is your responsibility to provide us with a valid e-mail address and to inform us of any changes to that address. To the extent that any provision of these terms is found by any court or authority to be invalid, unlawful or unenforceable, that provision will be deemed not to be a part of these terms and will not affect the enforceability of the remainder of these terms, nor will it affect the validity, lawfulness or enforceability of that provision in any other jurisdiction. The headings in these terms are for convenience only and do not affect their interpretation. These terms supercede any representation made by us or any of our employees or agents. Your contract with Tyre-Rite Ltd. does not affect your statutory rights.